This turned out super cute! I love the gold feathers! I found them in a bin in the bulk $5 fill a bag section at a local re-use store and knew I had to use them on something Steph. In fact, that is where the velvet and twine came from too. That looks great Kathleen, so seasonal but also very chic. 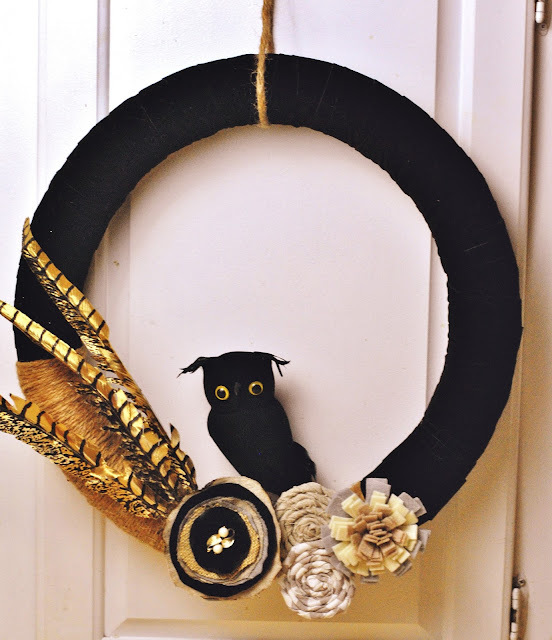 What a cute wreath - perfect for October and the fall season in general. I LOVE the unique color combo! This looks great. I love it! Like Toni, I've never seen anything like it before. You have such a great gift and eye, Kathleen! You did a great job. That is really cute! IT is so gorgeous!!!! You did a great job. Very cute you did a great job. That is both cute and elegant. Great door greeter. You did an amazing job! Love it!